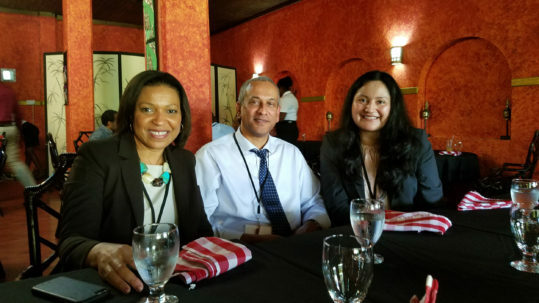 Vis together with Lisa Lewis (Digicel Group Project Director – Caribbean and Central America) and James Pitt (Cable & Wireless Communication – FLOW (CWC-FLOW) Country Manager. Senior Ministry of Education Officials from the Eastern Caribbean Sates and the Organization of American States convened a dialogue focused on the role of ICT in education. Vis Naidoo, Cell-Ed’s Chief Global and EdTech Officer was invited to present a paper on the Role of Technology within the School Ecosystem and to engage with Ministry officials on possible deployment of Cell-Ed. The dialogue took place on Oct 20-21 in Grenada. I am always in awe of the Caribbean and what is being achieved with so little resources. The dedication from the officials to take their education systems into the 21st century is admirable. The reports from the participating Eastern Caribbean countries illustrated the challenges faced daily, but also illustrated the progress being made. The OAS, under the able leadership of Kim Osborne (Chief Technical Co-operation Section) crafted an agenda that enabled constructive and fruitful dialogue, interesting presentations and concrete opportunities for Officials and private sector/development agencies and NPO partners to consider. The concept of using mobile phones to support teacher development, after school support and parental involvement was warmly received, especially with the focus on contextual and relevant content and courses. Given the good mobile phone coverage In the Caribbean and high access to the device (entry, feature and smart phones), using the Cell-Ed model was very useful to address the challenge of continuous teacher development, out of school youth (especially Boy learners), improving the quality of learning and community education (building the lifelong learning system). Vis with Ms Kim Osborne (Chief Technical Cooperation Section – OAS) and Prof Martha Cruz Zuniga (Professor of Economics, The Catholic University of America). Following on from luminaries like the Hon. Anthony Boatswain (Minister of Education, Grenada), Prof Martha Cruz Zuniga (Catholic University of America) and Alicia Banuelos (Minister of Science and Technology, San Luis, Argentina), my presentation offered an overview of key segments of the education system that needs to function for educational technology (edtech) to have the best effect on improving learning outcomes. I was fortunate to share the platform with Lisa Petrides (Institute for the Study of Knowledge Management in Education), who together with Marcela Morales (Open Education Consortium) provided a great overview of how using open education resources would support learning in the Caribbean. The Dialogue further illustrated the SDG #17 in action. The OAS invited Digicel and CWC-FLOW (local telecom companies), Microsoft, CARICOM Secretariat, Caribbean Development Bank, Alliance for Affordable Internet and Dr Vijay Kumar from MIT. The engagements between government, NPO, private sector and development agencies illustrated that with the right facilitation and commitment, concrete ideas and actions plans can be constructed. The litmus test – how do we implement this in the forthcoming months? It was a privilege to participate in the Dialogue, renew friendships and engage with new people. It is hoped that Cell-Ed can play an essential role in supporting of the education strategies in the region.